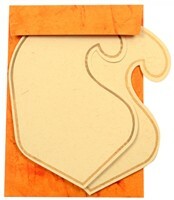 D-1175, Orange Color, Handmade Paper, Odd Shape Cards, House Warming. This designer card has been die cut in the shape of a big paisley motif and has embossed detailing composition in gold with kundan work. The paste-ups in the center provide the space for the symbol of your choice. The docket has a red base and it too has the paisley motif and golden borders. 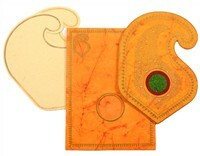 The inserts have golden border design and the envelope follows the overall card design. Silk Screen Printing in Maroon color. Gold color not suggestible ,visibility will be poor.